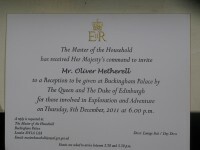 I’ve been invited to Buckingham Palace to a reception given by The Queen and The Duke of Edinburgh. 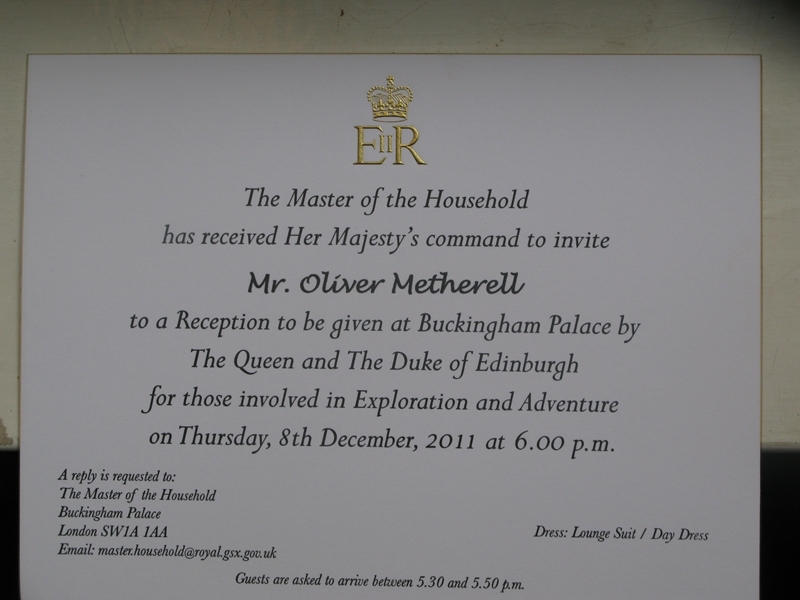 The reception is on the 8th December and it is being given for those involved in exploration. It commemorates the 100th Anniversary of Scott’s expedition to The South Pole. The boat lurched and I felt my bunk kick violently. Now I was flying… I grimaced into a ceiling that was a couple of inches above my nose: What was I doing here? Would I never learn? For sure this was the last time I was ever, ever going sailing. I was trying to sleep and my super-uncomfortable bunk with no headroom up in the forepeak of the vessel meant I was getting airtime on every wave. And seasickness as well. They say that the first stage of seasickness is thinking that you are going to die. The second stage is wishing you actually were dead. I was getting near to the second stage. Since 2005 I’d been on what was starting to feel like a never-ending, post-modern version of The Oddessey. The aim of the journey was to visit every one of the 7 continents and to attempt to make a first ascent. So far; North America, South America, Asia, Australasia and Europe had given us some interesting adventures. As I was planning the Antarctica stage I heard that Phil Wickens was organsing The Alpine Club Antarctica Expedition 2010 and he gave me a place on the trip along with climbing veterans Richmond McIntyre, Derek Buckle, Mike Fletcher, Dave Wynne Jones and Stuart Gallagher. I had mixed feelings about this trip… The mountains were not high; but the trip had all the factors that can make expedition climbing a bit demanding at times: Remote and challenging unclimbed mountains. Hazardous small boat navigation in waters strewn with icebergs and growlers… Oh yeah; did I mention the other things that were going to make this trip a bit special? We would be climbing in a place where the only option was self-rescue if things went wrong. And to get there; we would have to cross; (in a tiny sailing boat and via Cape Horn!) The Southern Ocean’s infamous Drake Passage; generally acknowledged to be the roughest ocean in the planet. The Drake Passage; in The Southern Ocean is rite of passage for anyone heading by boat to The Antarctic. Also known as ‘Paying The Drake Tax’ or ‘The Climber Filter.’ According to The Antarctic Cruising Guide by Peter Carey and Craig Franklin it is the narrowest portion of the easterly flowing Antarctic Circumpolar Current, the only place where it is squeezed between land masses. When forcing itself through the bottleneck the current moves 130million cubic meteres of or 170 million cubic yards of water per second. We’d teamed up with two expert ice skippers: Darrel Day and Cath Hew. It was their dream to run a Tilman-style expedition to Antarctica and they were passionately enthusiastic about teaming up with us and gave us a really great deal on the yacht charter. They had been sailing their yacht; ‘The Spirit of Sydney’ in these hazardous waters since 2003 and they were both the key to making this expedition happen. Not only did we have two expert ice skippers; but the boat ‘The Spirit of Sydney’ was also a noted vessel. Built of aluminium on heavy scantlings in 1986 The 60 ft long Spirit of Sydney was constructed in an era when the need for lightness was tempered by respect for the ocean. Her features included central heating; a drying area; a water-maker; a shower; submarine doors that separated 10 watertight sections and also a water-maker. Crossing the Drake takes about 4 days on a fast yacht like Spirit. Somewhere in the middle of The Drake Passage crossing is the polar front of Antarctic convergence. This is an oceanographic feature that makes the boundary between the Subartarctic water on the north and colder Antarctic waters from the south. The Drake is also a paradise for seabirds and a place to look for pairs of albatrosses with wingspans up to 9 feet who glided effortlessly in our wake. We didn’t land for days. The sea was angry for most of the time and squadrons of mountainous waves were marched relentlessly towards us. Every single time we hit a wave ie every 30 seconds; the snout (where four of us were sleeping forward of the mast in the forepeak) of the over-loaded boat (she’s about 9 tons overwieght reckoned our Skipper Darryl Day with her payload of 1400L of Diesel; 52 bottles of red wine; and a blush-inducing quantity of beer) would slam violently into the towering waves. Most of the front half of the boat would bury itself face first into the wave. Then a couple of hundred gallons of water would break over the bows. Over our skylight in the cabin it was about a few inches thick; and despite the fact it was meant to be watertight; a few drips of water would always scatter their way into our cabin and sleeping area. With tons of white water smothering her bows the yacht would pause for a: Will she? Won’t she? moment… When she did. Eventually. Rise; with water streaming from the gunnells ; the load on the powerful sails would combine with the hull being further out of the water. Cue viscously uncomfortable sideways twist of the the entire fuselage of the boat And anyone on board who had forgotten the sailor’s rule of ‘A hand for the boat and a hand for yourself’ would be hurled across the cabin with a malevolent and often painfull force. The Drake Passage was an experience that went on and on with the grim relentlessness of the last guest at the party. On the hill the character building experiences continued. I was sharing a tent with Richmond McIntyre and our wilderness camping skills on snow had ‘room’ for improvement. I well remembered how much hard work it was the last time I’d camped on a glacier. That was at our base camp in The Ruth Gorge for the Alaska stage of Super7 with James Mehigan in The Ruth Gorge. To combine with all the usual hard graft of living in a tiny tent you have all the challenges of melting snow. I remember me and James talking about how just surviving seemed to take up most of our days. And back then we had unlimited supplies of food and gas and a big comfy tent and a snow-hole mansion that we’d inherited from a mountain guide. Now we were living on 1400 calories per day; with a borrowed stove that we couldn’t make work correctly; and snow camping skills that were basic at best. The others were all super-experienced ski tourers and they had all the gear and all the techniques for the black art of snow camping wired. The low point was when I was attempting to get the stove to melt water and I spilled an entire pan; 2.5litres of water into the tent. On our first day we used a cannister of gas and it was supposed to last until day 2. We took emergency measures: cold food only and no hot drinks. It was day 5 until we were back on track and we could enjoy our first hot drink. Not good. The weather spooked me out as well. It seemed to follow no set pattern at all. It was either completely still with not a breath of wind… The silence seemed eerie at times. Then; seemingly out of nowhere; the wind would blow up and if you took your gloves off then frost injuries were just a few seconds away. The weather seemed to deteriorate in minutes with no warning. It often felt like we might be on the verge of a malevolent, tent-flattening storm. Otherwise the wind alternated between 20 minutes of wind which would build up to a howling crescendo and then stop; and there would then be 20 minutes of silence before the cycle began again. The climbing was different to anything I’d ever climbed before; and I realised that even if you are a fairly competent mixed climber; it counts for almost nothing when you are attempting to summit on big, scary, snowy mountains. All the routes that I had climbed before had been technical routes on faces or ridges and often the gear was excellent. All this mixed climbing had left a huge blank gaping hole in my climbing CV and it’s name was ski mountaineering. No one had been this much out of their depth since Captain Nemo got his foot stuck in a submarine. Why was I here? It was grim but every time I thought out about throwing in the towel the words of Margaret Thatcher would ring in my ears. ‘It’s easy to start things. But are you a finisher?’ And then Lance Armstrong would chime in. ‘Pain is temporory. Failuire is permanent.’ There was also the small matter of the eye-watering cost of going to Antarctica on a private expedition. I wasn’t sure I could afford a repeat trip down here. By day 4 the entire team apart from me had made a successful ascent of Nygren; Back in basecamp after bailing on False Shackleton with Stu and Dave while Derek, Mike, Phil and Rich made the first ascent I was learning all about the bitter taste of humble pie in my tent. Except without any pie to eat. At one point I was so hungry that I raided the bin, opened the foil wrappers for the compo rations and licked them clean. I also supplemented our basic rations by sucking clean the porridge scourer. I was reading a book by Sir Ernest Shackleton. ‘In trouble, danger and disappointment never give up hope. The worst can always be got over.’ His words were ringing in my ears as I looked at our remaining supplies of food and gas. We’d put in a lot of hard work to rein in our food consumption by not eating very much food (breakfast was 200g of porridge; lunch was four 67calorie cereal bars and the less that is said about dinner the better). We’d also worked hard to use solar sills for water. Now we had a decent amount of food and gas left and we could start to ‘buy forward’ as Rich put it. I wrote in my diary. ‘Tomorrow I will climb Mt Cloos’; and for the first time in 6 days I had a decent nights sleep. Tomorrow came and went; stormbound in in the tent. But the next day it seemed like we had a weather window. I started to eat more maybe 2500 calories. The food put fire in my veins and molten fuel in my belly. I felt light, strong, and stoked for climbing again. There is however an unfortunate ‘Houston we have a problem’ kind of an issue with the highest point – The large seracs that shield the first pitch of the route. Rich decided to go back to base camp at this point and it was just myself; Phil Wicken; Derek Buckle and Mike Fletcher who were up for the route. It was such a beautiful mountain; a real climber’s mountain; steep; shaped like a spinx and flanked with rock buttresses and seracs I really wanted to climb Mt Cloos. Underneath the seracs I am scared by their ominous silence. The climbing is going well today; we’re pioneering the first ascent of this beautiful mountain on good ice. The wind is howling but after the scary serac-threatened first pitch and now with those Damoclean seacs below us it feels like gravity will lessen her force for us today. The wind is strong, the temperatures are around -25 degrees with the wind chill; and we’re cold; but we’re having a day that will be burned into our memories forever in these remote mountains. It’s something I’ve always known…. I love it; I just love it. Pitch 2 takes us across the face. Pitch 3 features some spicy vertical ice, then a difficult move to pull from the vertical ice onto the summit snow slopes with a good screw below and then we are on the summit slopes. As we summit the mountain a white Petrel shares this remote place with us. ‘Hopefully a good omen for the descent’ says Mike. We’re tired we have been on the go for nearly 12 hours; and we talk about the need to keep a laser like focus on a safe descent. We all agree that the key to getting down is to simply down-climb pitch 3 and pitch 2 because the traverse above the seracs means that it makes no sense to abseil. Derek goes first; then Phil on a hastily arranged snow stake belay that I’m equalising as Mike pays out the rope. Then Mike leaves me to down-climb the route crux and I’m keeping him on a tight rope and and I’m all so alone on the summit slopes with what feels like a final exam in mountaineering below me. There are various options to protect me on down-climbing the crux of the route which went at about Scottish V. I could place a back-rope or get Mike to place some extra gear below the crux. It feels like the best option is to keep things very simple; be bold; and just reverse the crux moves I struggled to climb about an hour ago. I know that I won’t be able to communicate with Mike because of the sound of the wind and I calculate that there is far more chance of me having issues with a back-rope when out of communication with my partner than there is of me falling off. ‘You can do this’, I tell myself. I’ve asked the rest of the team to jack-boot the crux of the route (the place where the ice goes from steep summit slopes to verticalish) into submission; which they have done to fine effect and I try to keep my mental state as icy cool as the wind that howls around us with chilling frigidity (even tho’ in reality I am actually scared stupid). Now I have have down-climbed the crux and I’m back on the traverse; as the wind howls like a squadron of 747’s and the bitter cold snarls my layers of clothing like a wild animal. Derek has already set up an abseil for the ice pitch under the seracs now and now there is a call over the radio. It is 8pm and we are still on the mountain. It’s Stu Gallagher. ‘Everthing ok up there?’ he says in a voice that sounds worried ‘You’ve been a while’. Derek’s response was short and simple. ‘It’s hard.’ We rap the final pitch. I faff coiling the ropes and then we’re skiing down; just cruising on the ski’s; over the gentle slopes down to our camp and it feels good. Back in the tent I get a plate of hot food from Rich and I collapse into my sleeping bag. I’ve had enough. I feel mentally, emotionally, and physically drained. The only contingency we have in place for this situation is an emergency barrell full of basic food and some more gas cylinders that are sat on top of an fragile ice cliff on the shore that might or might not still be there. Me and Rich have one full cylinder of gas left and about 4 days left on half rations. Not good. I force myself to think of the bright side of the situation. None of us are injured. We still have radio and Iridium contact with the yacht. We can make liquid using solar stills. The food barrel and the spare gas will probably still be there. Stu can fish. In extremis; We might be able to kill some penguins or seals if we really get hungry. It is early December; spring the ice conditions will probably get better rather than worse. There is also a potential escape route over the back of False Shackleton. And like Phil says; Ice conditions change every day. And anyway; there is the potential of us moving out of Deloncle bay for a pick up somewhere else on The Lemaire. Maybe it will be okay… I look at the landscape around me. It was so hauntingly beautiful; and quiet…. Maybe this was where the real adventure began? I followed the team to the sea; moving or perhaps I should say mincing slowly on blistered feet. They had flown ahead of me on their long ski’s and I was struggling down on short ski’s that were attached to my Vega’s. As we descended The Lemaire channel became increasingly visible and about half a km away from The Lemaire channel things were not looking good. It was choked with ice and I mentally prepared myself for whatever was to come. I stood up straight and resolved to keep forging on; and just enjoy every moment of whatever was to come… That was how Shackleton styled it… ‘To be brave cheerily, to be patient with a glad heart, to stand the agonies of thirst with laughter and song, to walk beside death for months and never be sad that’s the spirit that makes courage worth having.’ he wrote after Elephant Island. As I descended to glacier The Lemaire was getting closer. And with it a hot sun and a dry mouth. The rest of the team were tearing ahead on their long ski’s. I’d been climbing for 18 hours yesterday and I hadn’t drunk enough water. I rounded the corner and had to do a double-take. Like a mirage in a desert of ice; The beautiful yacht with her flared bowsprit and low; clean lines was moored in the bay; tugging at her anchor and looking like an ocean-going Maserati. She was tugging at her anchor; an ocean greyhound; eager to race across the high seas once again. There was an awful lot of white ice surrounding her but she wasn’t choked in by it. Spirit of Sydney was there; sitting proud. I blinked tears out of my eyes and manfully, I refrained from blowing her a kiss. Soon we would be back on the boat. Thanks to The Gino Watkins Memorial Fund, The Alpine Club, The Lyon Equipment Award, The Mountaineering Council of Scotland, The Spirit of Sydney, Buff, Montane, Chromefire, Crux, Creation Editor, Primus and The Business for supporting this expedition. I’m delighted to be able to write that we completed the Super7 project with a new route on Afella in Morocco’s Atlas Mountains on Thursday 3rd Jan. I would like to thank our patron, our sponsors, and also The Gino Watkins Memorial Fund, The MC of S, The BMC, The MEF and The Alpine Club for making this possible. I would also like to thank my climbing partners, my family, and all of our friends and supporters who have helped to make this project happen. 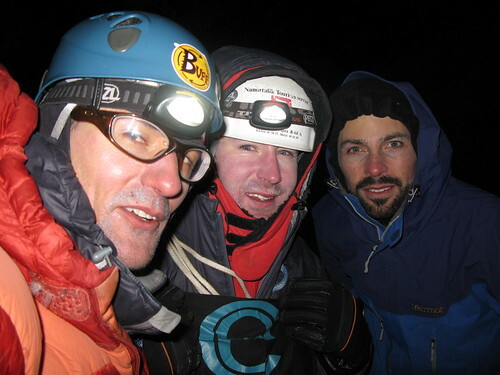 The expedition was led by Andy Stokes-Rees and myself (Olly Metherell) and James Mehigan made up the rest of the team. After a frantic evening of food shopping in Marrakesh myself and James had our first scary moment of the trip when we were led into the depths of the Labyrinthine streets of the medieval Souk at 11pm (with about £400 worth of shopping piled high on a hired hand-cart) by two mischevious locals who were ‘helping’ us to find our hotel. After a first attempt on the route on the Wed; it was eventually climbed at around ED1 on Thursday. The route is on the SE face of Afella (4045m) and is about 1.5 hours from the Nelter refuge on Ski’s. The climb features a challenging mixed pitch and then a gully which culminates in a vertical ice pillar. The route continues up the gully for one more pitch from where we descended by abseil. ‘Right Hand Chimney’. VII, Ben Nevis, Gareth Hughes and Olly Metherell. Also: Sioux Wall, VIII, Olly Metherelll and Ian Parnell. ‘Fountain Gully’, ED1, The Atlas Mountains, James Mehigan, Olly Metherell, Andrew Stokes-Rees. Mt Cloos is a mountain of approx 1200m that rises about two miles east of Deloncle Bay in the Lemaire Channel of The Antarctic Peninsular. The mountain was climbed on the 8th December by Phil Wickens, Derek Buckle, Mike Fletcher and myself. The route we took went under a hazardous serac band on the east face. It then traversed above the seracs and the crux of the route was pulliing from a verticalish ice funnel onto the summit snow slopes. We summitted at approx 8pm on the 8th and were back in basecamp at around about midnight. I’ve pasted some pictures and a diary extract from the day of the ascent. Thank you to all of our sponsors for supporting this. Thank you also Cath Hew and Darrell Day from yacht The Spirit of Sydney, The Mountaineering Council of Scotland, The Gino Watkins Memorial Fund and to Lyon Equipment. There is however an unfortunate ‘Houston; we have a problem’ kind of an issue with the highest point – The large seracs that shield the first pitch of the route. Rich decided to go back to base camp at this point and it was just myself; Phil Wickens; Derek Buckle and Mike Fletcher who were up for the route. It was such a beautiful mountain; a real climber’s mountain; steep; flanked with rock buttresses and seracs – I really wanted to pull this off. Underneath the seracs I am deafened by their pregnant silence. Just a few feet above me Derek and Phil are leading boldly out across the steep ice. They climb well; pioneering the first ascent of this beautiful mountain on good ice. The wind is howling but now the Seracs of Damocles below us it feels like gravity will lessen her force for us today. The team in front leave screws which are thankfully clipped by Mike and me. The wind is strong, the temperatures are around -25 degrees; but we’re having a day that will be burned into our memories forever in these remote mountains. It’s something I’ve always known…. I love it; I just love it. Pitch 2 takes us across the face. Pitch 3 features some spicy vertical ice, then a difficult move to pull from the vertical ice onto the summit snow slopes with a good screw below and then we are on the summit slopes; greeted by Derek and Phil who are back on the way down. For the ascent myself and Mike have been swapping leads; but Phil and Derek have had a rope to themselves ahead of us and they have placed all the gear. We all agree that the key to getting down is to simply reverse down-climb pitch 3 and pitch 2 because the traverse above the seracs means that it makes no sense to abseil. Derek goes first; then Phil on a hastily arranged snow stake belay that I’m still equalising as he downclimbs and Mike pays out the rope. Then Mike leaves me to downclimb the route crux and I’m keeping him on a tight rope and and I’m all so alone on the summit slopes with what feels like a final exam in climbing below me. There are various options to protect me on downclimbing the crux of the route which went at about Scottish V. I could place a backrope or get Mike to place some extra gear below the crux. It feels like the best option is to keep things very simple; be bold; and just reverse the moves I climbed about an hour ago. I know that I won’t be able to communicate with Mike because of the sound of the wind and I calculate that there is far more chance of me having issues with a backrope when out of communication with my partner than there is of me falling off. ‘You can do this’, I tell myself. I’ve asked the rest of the team to jack-boot the crux of the route (the place where the ice goes from steep summit slopes to verticalish) into submission; which they have done to fine effect and I force myself to keep my mental state as icy cool as the wind that howls around us with chilling frigidity (even tho’ in reality I am actually scared stupid). Now I have have downclimbed the crux and I’m back on the traverse; as the wind howls like a squadron of 747’s and the bitter cold snarls my layers of clothing like a wild animal. We may be out on a bit of a limb. The Lemaire Channel may be ice choked. We may have to wait on the shore and make Shackleton-style improvisations until we can get out of here; but we have climbed the route; and it feels so good. In the morning we get more info on ice conditions in the Lemaire Channel from Darrel over the radio. The words that I hear make my heart go on an express-elevator into my shoes. We might not be able to get picked up today. In the words of Shackleton; it is time to; ‘Put foot of hope into stirrip of patience.’…. This will be the main source of news from us when we are in Antarctica. I’m here with 3 of the team. Some of them have over 3 decades of expedition experience… We’re having some interesting conversations and I’m fortunate to be on a trip with them. The first drama of the expedition is that one of Derek’s bags are still in Madrid….. This will hopefully be sorted soon. Planning to relax today. Maybe do some low energy tourist activity like going for a walk in a bit. 19th Nov; 2108, Buenos Aires Time. Somewhere above the UK. I’ve just been to the bathroom and had a mosque style refreshing of feet, stuffed the used socks (soaked!) into the depths of the wellingtons and for the first time in 10 hours I am wearing just a jeans and a T-shirt and the increase in comfort levels has it feeling like my seat in coach has just been upgraded to first class. I’ve been advised to set my body clock to destination time; which I’ve done; and reset body clock to uk time using caffeine; which is now possible that I have successfully given up my 8 cups of tea a day habit.. To my surprise and delight; Buenos Aires is ONLY 3 hours ahead of France. That, basically, means, almost no jet lag; which is a very nice unexpected surprise. I am now looking forward to a nights sleep and to my first weekend ‘off’ for quite a while. Cigarettes blazing illegally in the station, Glass mugs containing vodka in hand, and enlarged photos of the more bride-to-be in more youthful times strapped to their necks, with matching black team hoodies with “SAZ BOB’S HEN WEEKEND” in flourescent pink. I intend for this trip to have the ‘festive’ atmosphere of the Newcastle hens… Aparently it is a tradition on the yacht to bring a bottle of alcohol, eg. Whisky, to imbibe… (however; there is no alcohol when we are actually attempting to cross The Southern Ocean). I will give my share to _____, who is more Whillanesque in his approach to these things. Anyway, I digress… Second try with the Edinburgh taxi drivers and my friend Liz pulls up in her extremely flash new M8 and we’re footed. Still working; I manage to delete loads of obsolete phone numbers from my telephone on the airport bus ride to Turnhouse. I arrive a splendid 4 hours in advance for the flight and after a visit to the airport prayer room I set up camp in Cafe Nero and power through a load more admin on the laptop. 2.5 hours before departure and I’m locked in the toilet cubicle re-distrubuting my clothing to decrease xs baggage charges. FEET: 3 pair of socks. Thigh length wellington boots for xing The Climber Filter (aka as The Southern Ocean or ‘Paying the Drake Tax’). The crossing seems to, ahem, filter the wheat from the chaff…. Legs. Med weight power stretch pants, full battle dress fleecs sallopettes. Howies jeans on top. I am extremely proud that they still can be semi buttoned up under such duress. TOP: 8 layers including full expedtion weight goose down jacket. The girl at the check-in is a sweetie and gives me an bulkhead aisle and tells me how to repack to miniminse xs charges. I split the load: 35 kilos into two lesser weights, plus what I’m wearing (approx 12kilos, plus handbagge of 10 kilos: Total payload: approx 55 kilos. All transport nodes are v quiet today and I spend about half an hour in a quiet corner of the airport getting this sorted. Even tho’ I’m still overweight I get the nod and then I get distracted by more work and go to gate 18 instead of 1E. The result of this is that I get to gate 18 late, late, late and then I have to run at about 75% of maximum effort down the entire length of the terminal building; (about a quarter of a mile); wearing 19 layers of clothing including a down jacket AND carrying a 10 kilo pack plus a laptop. I arrive; almost the last passanger at the gate, less than cool, calm and collected, just as it closes and fortunately; for the comfort of other passengers, I have an aisle plus one seat to myself as I steam off from the self-created sauna I have just made for myself. That’s it for now. About to leave Paris CDG. James Mehigan’s Article about the new route in North America. ‘I don’t want to die for someone else’s summit fever’. ‘Oliver, YOU said we should turn around at 6.30. It’s SEVEN OOOO’CLOOOOOCCCCK’. ‘What’s the point, he can’t hear me. Or he’s pretending not to. He knows it’s time to turn around.’ At this stage he was 40 metres up, swimming in squashy unconsolidated powder. I knew it was unconsolidated powder because most of the final snow slope to the col has sloshed over me in the last hour as I shuffled from foot to foot waiting for Oliver to finish this pitch. Well, it wasn’t that bad. I guess I was just being a princess. But it was late. Even in Alaska, with its longer days, in March 8pm is late and late is cold and cold is bad. We’d taken a long time to climb the last 180m of difficulties. But the advantage of slow progress and long approach slopes is that there wasn’t going to be so much abseiling to do in the dark. ‘Listen Oliver, this is a blank cheque descent. I don’t care how much gear we use, solid belays are it’. So once we had that agreed, it was off down. First we rapped back over the Scottish 7 crux of the route into this immense (well 4 foot wide, 8 foot deep and 8 foot high) cave that we had belayed in on the way up. We needed to rehydrate and Oliver needed to put on some new layers. He was borderline hypothermic from all the unconsolidated snow and wet almost entirely through. So we sat down in the cave and brewed up. Watching the alpenglow disappear from the mountains on the other side of the Ruth Gorge was the first time during the day we could actually relax. All we had to do was abseil home in the dark, not the original game plan, but we knew we could do it. We weren’t stuck for gear and we’d just been up the route. It’s hard to describe the ascent itself without venerating Oliver’s climbing skills and determination. His performance on the day was immense. The whole climb looked from the valley like a straightforward drainage line, like climbing in the winter in the Alps but placing our own gear. But when it came to the crunch, the route was actually a mess. You couldn’t call it ice or snow sometimes. It could be identified as a form of frozen water, but after that, words failed us. I’m sure there is a word for it in a language somewhere, for us however, we just referred to it in what law textbooks call ‘sailor’s language’ or ‘unparliamentary discourse’. Oliver climbed three epic pitches of this stuff. Sometimes bravely running it out. Sometimes spending hours prepping a move. Seriously, on the first pitch, three hours or so trying to get over the first overhang. It wasn’t an overhang when we arrived, but it had to be dug out into a cave, then headbutted out into a stance. At one stage he was standing up on this ‘stuff’ feeling his boots moving gently through it as it all collapsed slowly under his weight. Like he was trying to stand up on a three inch thick wall of rice-crispie buns. I know this because I had to second it and that was unpleasant enough. Nobody was upset to get to that belay. The crux, two pitches later, was an A1 haul out of the belay cave below the last pitch. I think it might have been impossible if there hadn’t been some ‘Thank-God’ polystyrene ice directly above the cave. This pitch, like every pitch on the route, looked so straightforward. From the valley, up the approach coulouir (like a big alpine Difficile gully), the technical ground looked okay. From the top of each pitch, the next pitch looked good to go. Finally, we thought, we would make some progress. But ice is a fickle friend and once established, each pitch presented its own set of problems. Progress was slow. Even the last pitch to the col. It looked so straightforward, just a 55 degree snow slope running up to the col. Easy ground they call it, don’t they? Not today. This was like swimming, only uphill. Despite all that we climbed it. A new route in Alaska. Can’t complain. That’s what we set out to do, so we called our shots and the balls went in the pocket, and given the shakey weather we’d been having, that was a very pleasing experience. Will it be a classic? Not unless conditions change substantially. Would I do it again? Not in a blind fit. Was it worth it? Yes, what a great day. 22 hours after leaving the tent, we finally unzipped it again. We had pushed ourselves a great deal, climbed well together and had some amazing views, belays and climbing, even if it was a little sketchy at times. The greatest beauty of the Ruth Gorge being perhaps the ease of access from base camp to so many great climbs. Access is so straightforward, that a japanese underwear company flew in 15 locals to do a commercial on the glacier. Our taxi man was one of them, apparently things got a bit stressful when the weather started coming in. Only a few planes would fly, and the thought of spending a night in an Alaskan storm wearing only lycra and the best Japanese underwear scared even the hardiest Alaskan. We had spent over a week checking out potential routes, and we had been almost to the base of Tower Couloir to mark the crevasses with bamboo poles before we climbed it. The approach then on the morning of the climb was less than 2 hours on skis, almost all flat. If it wasn’t for the climbing, you might even consider it civilized. With the airplane access, you don’t need any porters and you won’t break a sweat before you’ve set up base camp. Well, unless you’re a squeamish flier. The descent onto the landing strip in the gorge was cloudy the day we did it and each rotation down meant flying directly at large alpine faces, before turning at the last minute only to fly directly at another. If you ever want to know what a plane crash looks like in the seconds before it happens, fly into the Ruth Gorge. Montane, Chromefire, Bristo Yoga School, Lyon Equipment, Pocket Mountains and The Mountaineering Council of Scotland for supporting this expedition. The Great Gorge of the Ruth Glacier runs almost perfectly north-south and lies south east of Denali in the Denali National Park in Alaska. It is an alpinist’s paradise being a parallel sided glacier from whose sides rise massive steep peaks of the quality of great alpine north faces. Approaches are not long (though they can be heavily crevassed) and altitude is not really a problem (the highest peaks are c.3000m) The best guidebook to the area is Joe Puryear’s ‘Alaska’ published by supertopo. There is also a fantastic set of pictures with route markings of all the major peaks in the Gorge in the 2006 American Alpine Club Journal. Access is by ski plane from Talkeetna (3 hours drive north of Anchorage where we flew into). We used Talkeetna Air Taxi www.talkeetnaair.com who have the best reputation for looking after climbers in the range. We found them excellent. It’s hard to be certain when the best time to go is. We were pretty early hoping the ice would be well frozen and consolidated (it wasn’t) but people climb there much later and it only seemed to be kicking off as we left (mid April). They climb rock in the gorge in the summer, as early as June which is hard to believe. We have a full report, with a lot more detail on the logistical information. If anyone is interested, contact us through the website. The Antarctica trip has been the recipient of The Lyon Equipment Award and a Mountaineering Council of Scotland Grant. As I’m sure you know; Lyon Equipment are the distributor of high end mountaineering kit; including Beal ropes and Petzl. They’ve been generous supporters of our trips in the past; and they have also sponsored our events…. The MC of S has also consistently supported this adventure and it would be not have been possible without them backing us financially. I spent most of the past month attempting to organise sponsorship. The fish aren’t biting – YET! But we’re already about two thirds of the way there; thanks to some generous supporters from behind the scenes! I’ve been getting back into training (three sessions of climbing per week!) and there was light in the sky at 8pm last week. This summer is gonna be a scorcher!